David Alt, author and a retired professor of geology at the University of Montana, explains why gold was found in Grasshopper Creek and the surrounding gulches. “At Bannack, as in many gold mining districts, much of the production came fast and early from bonanza deposits in stream placers. Early miners working the gravels in the streambed skimmed the cream off the district, leaving the hardest work and leanest pickings for those who came later. That happens because streams concentrate gold as though they were natural sluice boxes. The process is really quite simple. The early gold miners weren’t always satisfied with just a placer deposit. Many lived with the conviction that far greater wealth must exist in the bedrock. But in fact, bedrock deposits are generally much leaner than those in the streambed and more difficult to work. Bannack proved to be no exception. 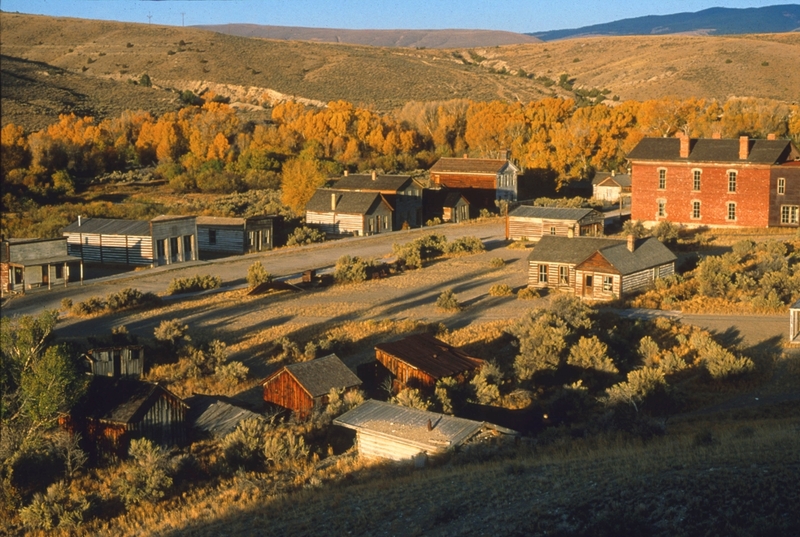 At first glance, Bannack must have seemed an unlikely place to look for an ore body. The pebbles and boulders along the creek are limestone, a specimen that rarely contains gold. And since there is no gold upstream from Bannack and very little downstream, the source of the bedrock gold must be within the cliffs above the area. Geologists postulate that during a period of widespread volcanic activity in southwestern Montana, the limestone canyon walls on each side of Grasshopper Creek and a few hundred feet above its level were intruded by large masses of molten magma. The rock formed by the hardened magma was the most common igneous intrusion – granite. When molten granite magma comes in contact with limestone, it reacts to create a wide variety of minerals. As the magma hardens, it forms an outside layer over the granite intrusion, separating it from the limestone. This mineral-filled contact zone may be anywhere from a few feet to a few hundred feet thick. Prospectors know contact zones around granite intrusions, especially those in limestone, are likely to contain deposits of gold. The early miners at Bannack learned that fact well. Before the summer of 1862 ended, they found the gold in the contact zone and staked claims around its margins on both sides of Grasshopper Creek. This geologic process and its rich mineral results extended well beyond Bannack and are responsible for southwest Montana becoming the catalyst that gave life to Big Sky Country. Fort Benton may be considered the state's birthplace – as it is the oldest continuing community – but it was southwest Montana and its geology that provided the reason steamboats carried thousands of would-be wealthy men to Fort Benton to strike out overland for the hills and valleys of Montana's southwest province. earth into every nook and cranny just below its surface. The intrusions formed are usually erosion resistant, and when the overburden of sediments above them is worn away, they form hills and mountains. The gold found in Last Chance Gulch leading to the founding of Helena is a result of a batholith. In some instances, especially with the Boulder Batholith, which begins just south of Helena and follows a rather narrow corridor toward Butte and a bit beyond to the Highlands, the molten material reached daylight and covered the original rocks. In the immediate Helena area, gray limestone sediments give way to outcrops of the light- to dark-gray and sometimes reddish-brown granite of the batholith. The Idaho Batholith, primarily in Idaho, extends more than 16,000 square miles. Parts of it reach into Montana south of Stevensville and into the Bitterroot Mountains. It and its Montana counterpart need to be thanked, as the great gold, silver and copper camps of Montana's and Idaho’s recent past owe their existence to these underground creations.